About two years ago, I set myself the task of reading every issue (not necessarily every appearance) of Captain America. Even five year ago this would have been an impossible task: the old issues are collectors' items worth hundreds of dollars and many of them have never been reprinted. When I was a fanboy I used to think that if I had three wishes; the first would be to spend a month in Marvel Comics' archives, reading all the comics which I had heard about but never seen. (The second would have been to spend a month in the BBC's Doctor Who archives, obviously.) But with the advent of tablet computers, wi-fi and Marvel Unlimited I can sit Cafe Kino with a flat white and a beetroot muffin and literally call up literally any Marvel Comic from the last seventy five years. This also holds true for Frank Sinatra records, back numbers of the Times, and the early Christian fathers. Remember this the next time you complain that young people are glued to their screens all day. Having come to the end of this Proustian voyage, I thought it would be fun to make a list of episodes that stuck in my mind and write down what I thought about them. It's quite a random list. Very likely there were good episodes that weren’t memorable, and memorable episodes that weren’t very good. What I've ended up with is a set of notes. It is not a biography of Captain America. It isn’t a history of American comics. And it certainly isn’t a history of America. Captain America #1 came out as much as a year before Pearl Harbour. It wasn’t just the Captain who was delivering a sock on the jaw to the Fuehrer, it was Jakob Kurtzburg and Hymie Simon punching isolationists in the mouth. 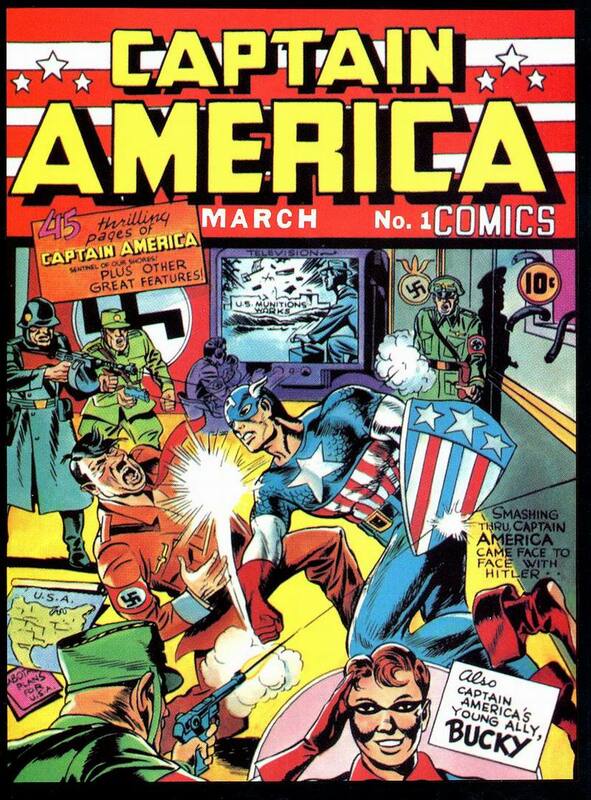 There are stories of copies of Captain America #1 being burned at Bund rallies. When some isolationists turned up at Timely Comics offices to protest about the comic, Kirby had to be physically restrained from doing the Captain America thing himself. Skinny recruit, rejected by the army. Volunteers to be the guinea pig in an experiment to create a new breed of super human soldiers. The experiment works fine, but Nazis assassinate the chief scientist, who never thought to write his formula down. So Steve Roger is America's one and only Super Soldier. In 1965, Simon's partner Kirby recreated the story with his new partner, one Stan Lee. It's worth glancing at the differences between them. "As the ruthless war mongers of Europe focus their eyes on a peace-loving America the youth of our country heed the call to arm for defense". The Lee / Kirby version also began with a group of young recruits, this time queuing for their medical; but the newsreel voice has given way to Uncle Stan regaling the young people with his war stories. For Stan, the war is already something to be looked back on with fond nostalgia, hanging out with the guys and maybe being made to peel potatoes by a barking sergeant. Not for the last time he misunderstood the artwork that Kirby gave him. 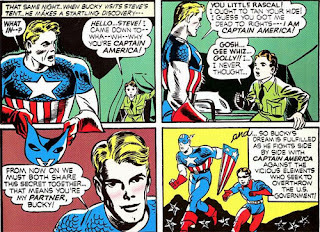 Kirby shows us healthy young men who really want to join the fight against Fascism; before introducing us to Steve Rogers, who wants to fight too, but is so puny he isn't allowed to. Jokes about the army taking anyone (the whole point is that they don't) and banter between the doctor and the hopeful draft dodger ("I got a bad case of hay fever, doc") undermine the moment. The U.S introduced peacetime conscription for the first time in September 1940; months before Captain America # 1 came out. In the 1941 comic, the point is that fifth columnists can fairly easily infiltrate the army with forged papers, and America needs a Super Soldier to ferret them out. In 1964 the point is…it’s not actually quite clear. Stan seems to think the war has already started, but the splash page proclaims it’s still 1941. In 1941 a figure who is explicitly President Roosevelt calls in a FBI man called, er, J Arthur Grover to present the brass with a plan for rooting out traitors and saboteurs. In 1960, the President announces something called Operation Rebirth, without being quite clear what it's for. (But the march of liberty and freedom can never be halted, apparently). In 1941 Prof Reintein gives Steve Rogers an injection ("inoculation") to turn him into a super-soldier. In the rewrite Prof Erskine gives him a huge test tube to drink from, which makes him more like an active participant in his rebirth, less a guinea pig. (Years later it was decided that he was also bombarded with something called Vita-rays, possibly to make the Super Soldier Serum seem less like steroids.) In '41, the newly empowered Rogers says things like "Come on out, you skunk" while in 1964 he says "Dr Erskine is dead...and his formula has died with him. There can be no more like me! But I shall fight for all those who might have been!" Because this is now Stan Lee World where everyone talks in speeches all the time! A secret agent can't so much as take her mask off without saying "At last I can divest myself of this disguise! The die is cast! Nothing can change things now!" And then there is Bucky. Bucky makes no sense. Robin never made much sense, but the conceit that Batman gains his strength from his rage and grief kind of works, so it kind of works that he should hang out with a young lad whose family were also murdered. But Bucky? Steve Rogers is now Private Steve Rogers in the US Army, pretending to be a hopeless soldier and getting yelled at by a comedy Sarge. Bucky Barnes is "camp mascot" whatever the hell that means. (I know some regiments have goats and dogs as their "mascot", but was it really commonplace to have eight year old boys? ) One night Bucky sticks his head into Private Steve Rogers tent and finds him putting on his Captain America mask. “Gosh, gee whiz, golly!! I never thought..” he explains. Stan Lee, hugely improves this to “That costume! That face mask! Now I see it! Holy smoke! It can’t be!” 60s Captain America appeared to get his dialogue from the Big Book of super-villain rants: “I was careless! I should have faced the tent entrance! But now..what am I going to do with you!” 1940s Cap was more direct: “You little rascal! I ought to tan you hide!" (Little rascal. Ret-con it all you like, but '40s Bucky can't have been more than eleven years old.) Everyone agrees that now Bucky knows Captain America’s secret identity, he will have to become his partner even though he's a little boy, hasn't been jabbed with the super-soldier serum and has never seen combat. So that no-one will suspect that Bucky is now Captain America’s partner, Bucky adopts the the super-hero identity of “Bucky”. "Captain America Back From the Dead!" 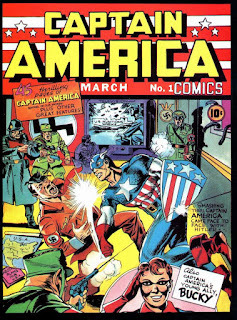 Captain America, along with the Human Torch and Sub-Mariner continued their adventures well after the real life Nazis were defeated, but they finally ceased publication in 1949. American children had just become bored with superheroes. The pleasantly named Young Men represented a rather half-hearted attempt to revive them. What has happened in the intervening years? 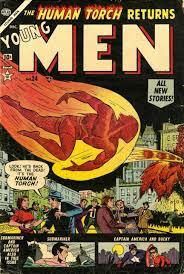 Seems that everyone thinks that the Human Torch is dead: in reality, a villain buried him in the desert at the end of the war. Similarly, people think that Captain America is also dead (or else "an old fogey") but he's merely retired and become a history teacher. Someone digs the Torch up; Cap comes out of retirement because the Red Skull is back in business. It's now the 50s, and he really is the "Red" Skull. So the sense that not-yet Marvel Comics are creating a kind of alternative history — that you need story-internal explanations for breaks in publication — is already kicking in, six years before "Flash of Two Worlds" and a decade before the Marvel Universe. If this had been a big significant story it would never have worked. 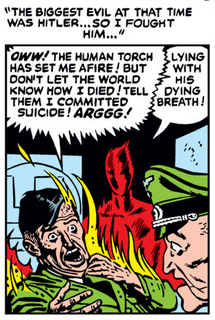 It's the idea that we can be told that the Torch killed Hitler, in passing, in a flashback — that great events come and go in single panels — that made the Golden and Silver Ages so much more fun than the Grimdark Age. There is no suggestion, of course, that this Captain America is not the real Captain America. The infamous Captain America Commie Smasher stories stand up fairly well, and are no more racist than the wartime episodes. Indeed, both series are rooted in paranoia, with the 40s Cap hunting saboteurs and fifth columnists and the 50s Cap going after commie spies. Both comics often look more like Gothic horror tales than war comics. 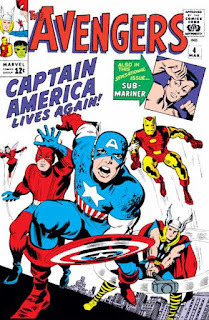 We all know that Cap spent the war fighting the jerries alongside our gallant fighting forces, but that's not a very common motif in the comics themselves. Bucky was dead to begin with. There was no doubt whatsoever about that. The 1954 revival of Captain America lasted until, er, 1955. So when Stan Lee brought Captain America back for the second time, he had a nine year absence to explain away. Just as the Torch got buried at the end of the war and revived in 1954, so it turns out that Cap got frozen in 1945 and defrosted in 1964. Whether Stan had forgotten the “commie smasher” episodes or simply chose to ignore them, this idea turns Captain America from a one note golden age super-guy with a patriotic costume into an inexhaustible mythic figure. Where Batman and Spider-Man are endlessly updated to be contemporary with the current crop of readers, Captain America is always a man out of his time: The Living Legend of World War Two Exclamation Mark Exclamation Mark. The cover proclaims that Captain America Lives Again, but Bucky is dead. Properly dead. He was clinging to an experimental drone bomber, convinced he could defuse the bomb. Cap leaps to save him but falls in the sea. Possibly the English Channel, possibly Newfoundland, maybe somewhere near Greenland. At any rate he gets frozen. The bomb goes off. Bucky gets vaporized. Captain America emerging from the ice is one of the most iconic images in comics; and the war time flashbacks represent Jack Kirby at his most visceral. When I was about 10, there was a British reprint comic, magazine sized, with a glossy cover that forced the price up to an insane 6p. Spider-Man cost a sensible 5p but the cover was only newsprint. I imagine that the Avengers Wonder Weapon turned out to be one of those potato guns they gave away with ever fifth issue of the Beano. The first issue I could afford to buy (issue 6) reprinted this story. So the first page of this issue was the first time I ever clapped eyes on Captain America. And he was quite clearly bonkers. The splash page shows him hurling his mighty shield at a gigantic figure in a purple mask. Well, it would have been purple, but even 6p didn't buy you colour printing in 1973. It's Baron Zemo, the Nazi Agent who killed Bucky and freeze dried the Captain. Except it isn’t: Cap is hallucinating. "Let me go! He's mine! Mine!" He did a lot of this in the early days. When he first meets Rick Jones, he mistakes him for Bucky (understandably, because Kirby drew all teenagers the same). When he realizes his mistake, he announces that he's been wasting time (about five pages) mourning Bucky, and that Rick has made him realize that life goes on. (Rick suggests that what he actually needs is a psychiatrist.) A few issues later, Rick tries on one of Bucky's costumes and Cap goes into full scale rant mode “I said take it off!…Don’t ever call yourself my partner again! I lost my partner!! I’ll never forgive myself for letting it happen!! !” Captain America is so obsessed with punishing Zemo for killing Bucky that he attacks blank walls. Possibly Stan Lee thought that at least one character needed to say "vengeance" and "avenge" from time to time to justify the book's title. So the first and primary thing I knew about Captain America was angst and guilt. Guilt and angst. I knew nothing about the Super Soldier Serum, and they never really made that much of the man-out-of-time angle. And his powers weren't that interesting. Captain America's grief was almost his whole persona. He was Bucky Guilt Guy, just as surely as Thor was Divided Loyalty Guy and Spider-Man was Responsibility Guy. 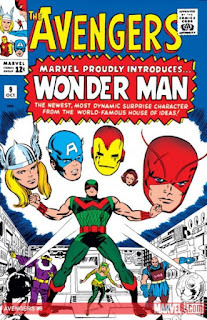 The ridiculously named Wonder-Man dies at the end of the issue. "With all our power we can't save him??" suggests Giant Man. "Sometimes my friend even power is not enough!...As well I know!" ripostes Captain America. You got an awful lot of angst and grief for 6p. 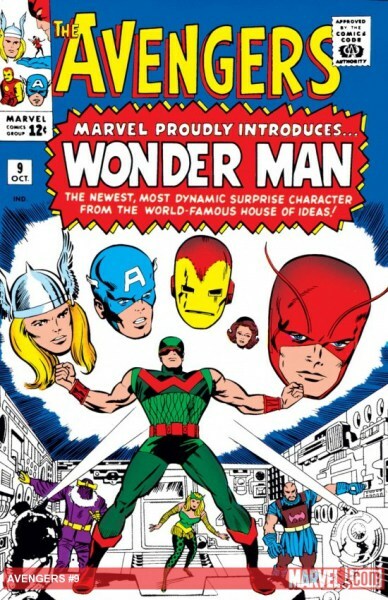 Wonder-Man recovered from his death a few years later. Superhero characters usually do. But the death of Bucky is so central to the Captain America mythos that he is the one dead character who can never, ever return. Have you ever wished you and your friends could do something to help our gallant bloggers, risking their lives every day in the cause of freedom? Use your allowance to buy War Bonds! 50c will pay for ten pens for our blogger to use in writing practice; $1 will pay for a cup of coffee to keep him alert, and $5 will enable him to sink a Ratzi battle ship single handed. Or something.